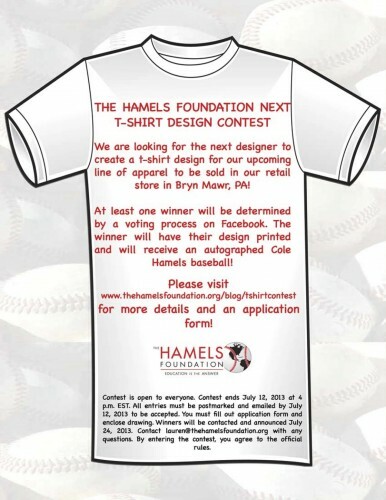 Zoo With Roy: Yo, Design a Shirt for the Hamels Foundation! WHAT DO THEY WANT? For you to create a t-shirt design for their upcoming line of apparel to be sold in our retail store in Bryn Mawr, PA! WHO WINS? THF will select 10 finalists and the winner will be determined by a voting process on Facebook. WHAT DO I WIN? Life-long fame, knowledge of having contributed to a great organization, and a Cole Hamels autographed baseball! ANYTHING ELSE? Yes, you have to fill out a form and follow their detailed instructions for submission. That can all be found here. I like the design in the article.